Latin Aloud presents 101 Latin Masterworks on CD. With a run-time of over five hours, these dramatic interpretations by a master of the Restored Classical Pronunciation, Dr. Robert P. Sonkowsky, play on any computer and most contemporary CD and DVD players. Tracks broken into individual poems, odes, and digestible portions of longer works. Accompanies any of Bolchazy-Carducci’s Latin author readers and workbooks. 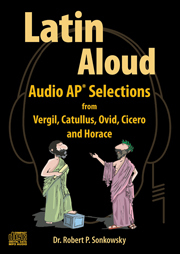 Latin Aloud list of audio recordings on the CD. on 2/13/2014 Your students can learn from a master! Dr. Sonkowsky brings these passages to life in a way that will enthrall and inspire students. His performance is masterful. What better way to give your students a perfect model of pronunciation, rhythm, and elision? Students love to imitate his deep, resonant voice. The 101 tracks are clearly marked and easily accessible through a clear menu. Indispensable to anyone who teaches poetry (my students don't take even the AP, but we find the selections here a perfect complement to a poetry survey course).